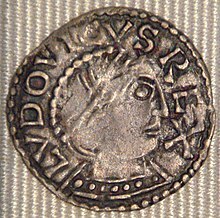 Rudolph or Rudolf was the elected King of France from 923 until his death in 936. Prior to his election as king, he was Duke of Burgundy and Count of Troyes from 921. He was the son of Richard, Duke of Burgundy, and Adelaide of Auxerre, and inherited the Duchy of Burgundy from his father. He married Emma of France, daughter of king Robert I of France. He is frequently confused with his uncle Rudolph I of Burgundy. Gerberga of Saxony was a French queen who ruled as regent of France during the minority of her son Lothair in 954–959. She was a member of the Ottonian dynasty. Her first husband was Gilbert, Duke of Lorraine. Her second husband was Louis IV of France. Contemporary sources describe her as a highly educated, intelligent and forceful political player.